If you are looking to find hidden treasures in all their retro glory, look no further. I have already started a Connecticut Thrift Directory for some of the best thrift and vintage boutiques in the nutmeg state but wanted to expand to diners, bowling alleys and other attractions. Lucky Strikes opened in 1967 and still has paper score sheets (no computerized scoring), duckpins, and 70's retro décor (think colorful murals and plastic). For retro on top of retro, eight of Lucky Strikes' lanes come from the old Willimantic Lucky Strike built in 1925. Connecticut's only classic, drive in movie theater play first run double features. It also has a snack bar! I went here as a little girl and saw Apollo 13 and Clueless! On Sundays, they offer up an outdoor flea market - come rain or shine. The Strand Theater has been operating since 1941. It's located in the charming, old fashioned downtown of Seymour, CT. It's very Golden Hollywood meets small town. They show cult classic and serve up fresh popcorn. 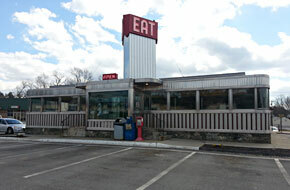 Zip's serves up food in a dining car! It's been around since 1954. This stainless steel diner will give you all the '50s feels! Their "belly buster 3 egg omelette" is a customer, classic favorite! This diner has a strong Irish influence! It still provides American fare. It was open in 1941 and still have it's retro, Irish charm. O'Rourke's was even featured on Diners, Drive-Ins and Dives! New Haven style pizza is served up in this 1920's Philadelphia out of operation train! It's been featured in many films, including "The Haunting of Amelia"
The Griswold Inn has been in operation since 1776. It has a lively tap room full of live music from everything from sea songs to swing to jazz. It also has a hotel chalk full of history including a private maritime art collection and a museum-style store. These are just some of the grooviest, retro places in CT! I'd love to keep this post open and hear what your favorite vintage places and spaces in CT are!